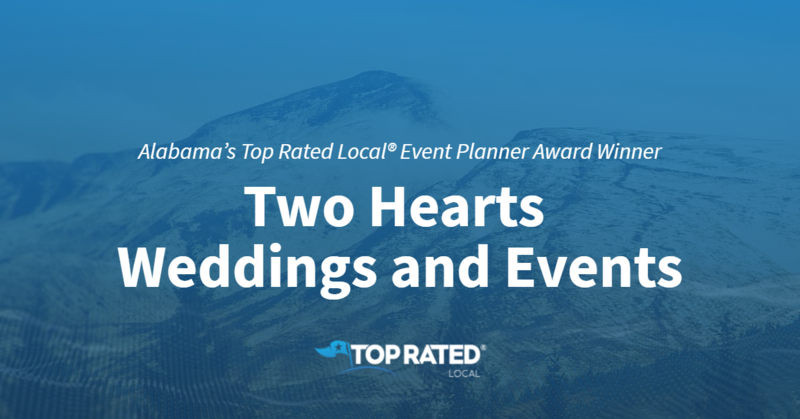 Top Rated Local® is pleased to announce that Two Hearts Weddings and Events is a 2019 award winner! Reviews just like this have earned Two Hearts Weddings and Events a 4.97 average star rating on verified review sites, a 96.70 Rating Score™, and a spot among the top three event planning businesses in Alabama for 2019! We spoke with Rachael Grammer, lead planner and designer at Two Hearts Weddings and Events, about the business’ online reputation. Rachael and her team are proud to personalize their services for each and every customer. When working with Two Hearts Weddings and Events, you can count on the talented team to share helpful tips and tricks with you, as well as an inside look into how they do what they do. In fact, this attention to detail in service is what Rachael would call her “secret to success”. “In the words of Dori from Finding Nemo, ‘just keep swimming’. Regardless of the number of followers you have, it’s important to keep posting, commenting, and blogging. Believe me, you have followers you’re not even aware of. Also, don’t be afraid to ask your clients for reviews. Real client comments are gold and help you hone in on your message and marketing plan. Congratulations to the team at Two Hearts Weddings and Events for being a 2019 Top Rated Local award winner, and thank you so much, Rachael, for taking the time to speak with us!